Scarborough Bowls Centre is situated on the junction of Peasholm Road and Queens Parade which overlooks the picturesque North Bay. It is very close to all the main attractions on the North side including Peasholm Park, Miniature Railway, Sealife Centre and the Cricket Ground. The predominant Clifton Hotel is opposite the Centre on Queens Parade. 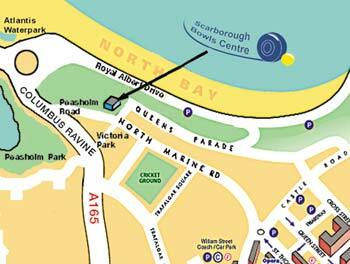 Use the interactive Google Map below to help find us.